A central figure in Victorian science, William Whewell (1794-1866) held professorships in Mineralogy and Moral Philosophy at Trinity College, Cambridge, before becoming Master of the college in 1841. His mathematical textbooks, such as A Treatise on Dynamics (1823), were instrumental in bringing French analytical methods into British science. 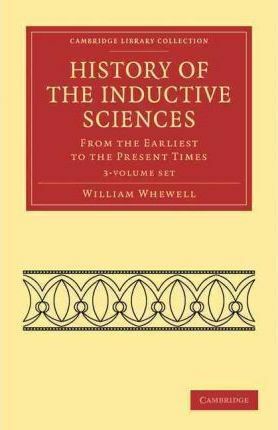 This three-volume history, first published in 1837, is one of Whewell's most famous works. Taking the 'acute, but fruitless, essays of Greek philosophy' as a starting point, it provides a history of the physical sciences that culminates with the mechanics, astronomy, and chemistry of 'modern times'. Volume 1 focuses on ancient Greek physics and metaphysics and their reception during the middle ages. Volume 2 discusses the rise of modern mechanics and emphasises the paradigmatic shift from mere observation to the explanation of causes. Volume 3 highlights the convergence of mechanical and chemical theories in discoveries about electricity, magnetism and thermodynamics. Part I. The Mechanical Sciences; Book VI. History of Mechanics, Including Fluid Mechanics; Part II. The Secondary Mechanical Sciences; Book VIII. History of Acoustics; Part III. The Mechanico-Chemical Sciences; Book XI. History of Electricity; Part IV. The Analytical Science. Book XIV. History of Chemistry; Part V. The Analytico-Classificatory Science; Book XV. History of Mineralogy; Part VI. Classificatory Sciences; Book XVI. History of Systematic Botany and Zoology; Part VII. Organical Sciences; Book XVII. History of Physiology and Comparative Anatomy; Part VIII. The Palaetiological Sciences; Book XVIII. History of Geology.